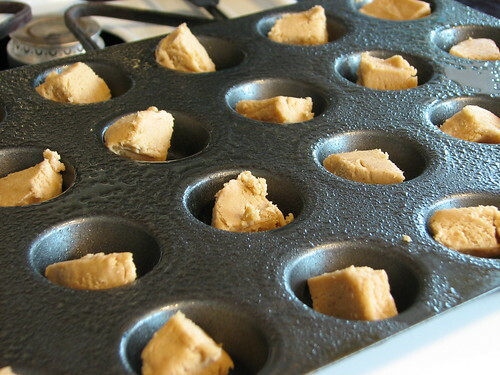 Optional: Placing the muffin tins on cookie sheets to bake, makes it easier to remove them from the oven. 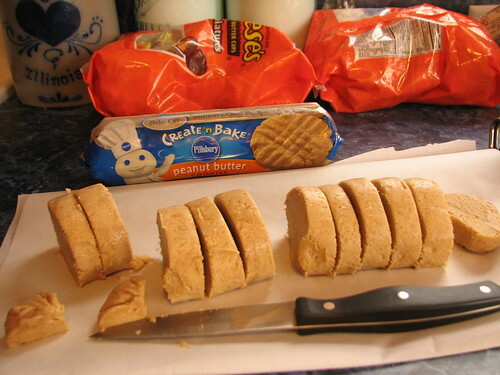 Use any peanut butter cookie recipe. I prefer this one: Honey Peanut Butter Cookies. 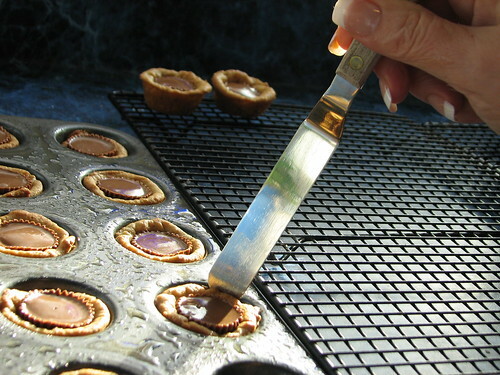 Spoon small amounts (probably about 2 teaspoonfuls) into small 1 3/4″ muffin tins that have been sprayed with Pam. Don’t over fill. 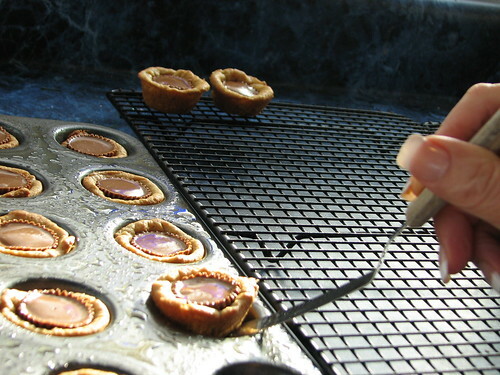 If the dough bakes over the top of the tin, the cookie will be difficult to remove from the muffin tin. Bake for 8-10 minutes at 350. Nine minutes is just right in my oven. 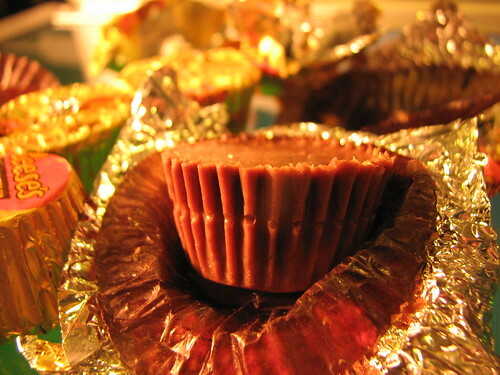 While they are baking, unwrap as many of the mini peanut butter cups as you will need. 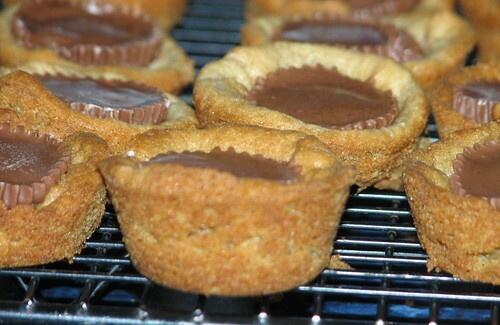 As soon as the muffin tins are removed from the oven, press a small peanut butter cup into the center of each cookie. The first few times I made this recipe, I used store bought refrigerator cookie dough. Now I use a peanut butter cookie recipe and I find the cookies made from scratch seem to release from the muffin tin better than the store-bought tube of dough. But store-bought is fine. There might be a few rejects, but you can use those for guilt free taste testing, right? 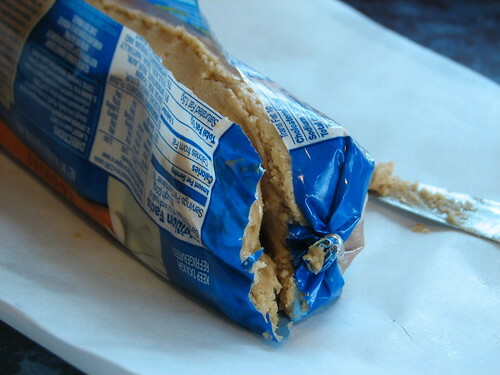 The store-bought cookie dough can be easily removed from the wrapper if you cut the plastic wrapper with a knife and, on each end, go all the way down to the opposite side. That makes it easy to slide the dough out of the wrapper without leaving dough stuck to the ends. It’s hard to tell in this picture, but there is no need to cut into the dough. Just cut through the wrapper. Slice the dough into 12 slices and divide each slice into four pieces. If using more than one roll of dough, store the addition rolls in the refridgerator until needed. If left on the counter at room temperature, the dough gets soft quickly which makes it harder to work with. You don’t have to roll the dough into balls or smoosh it down or anything else. Just drop it into well greased muffin tins. Bake. 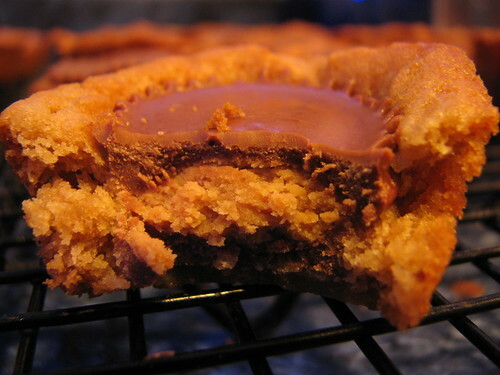 As soon as the tins are removed from the oven, push a small peanut butter cup into each cookie. 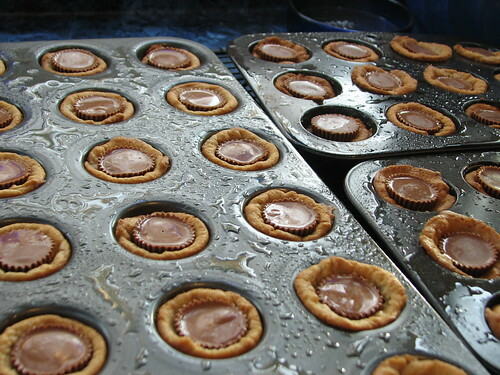 After adding the peanut butter cups, leave the cookies in the tins to cool. The dough is soft and fragile while warm. If they are removed immediately, the cookies fall apart. When cool, I gently slide a small frosting spatula along the edge of the cups to loosen them. At this point, I freeze the cookies until time to serve. Before the open house, I will thaw them and drizzle them with melted almond bark (vanilla) and decorate with chocolate sprinkles. You could use red and/or green candy melts to drizzle over the tops and decorate with candy sprinkles. Or drizzle with melted chocolate and sprinkle with chopped peanuts…lots of ways to decorate them. Or leave them plain! Wal-Mart sells mint cups that are similar to the peanut butter cups and I like to use them with sugar cookie dough. This entry was written by ~~Rhonda, posted on November 11, 2008 at 9:50 pm, filed under cookies and tagged cookies, peanut butter cup cookies. Bookmark the permalink. Follow any comments here with the RSS feed for this post. Post a comment or leave a trackback: Trackback URL. I made these for the first time last Christmas and my family loved them! Wow! Yummy and they look super easy. We may have a new favorite around here! !